Baking requires having enough quiet, or at least some point in the day that’s still. When done in haste or if distracted, something invariably goes awry. 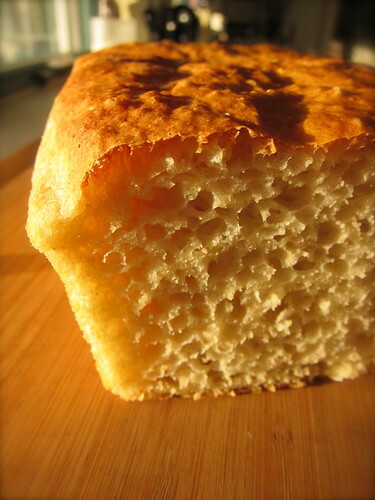 This simple loaf of English Muffin Bread is my atonement for a recent baking mishap, where I was in a hurry and left out an ingredient, making all the difference between something edible and something not. Tucked in a brief chapter on batter breads, this recipe is from James Beard’s comfy book, Beard on Bread. It’s based on English muffin batter, and requires the uncommon step of stirring in a baking soda solution after the first rise. It gives the resulting loaf a coarse, open texture. Once the bread is done, it’s good sliced into thick shingles, and topped with a lavish amount of butter and a drizzle of honey. Sliced more thinly, it pairs well with smoked salmon, like a poor man’s brioche. Either way, to avoid it seeming underdone, do toast it before serving. It’s nice to know that this batter can be made entirely by hand, as instructed in the original recipe. 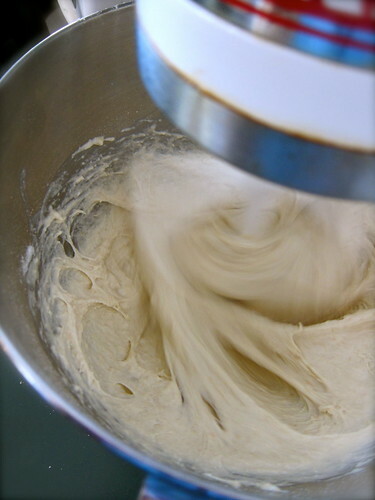 Here, though, I’ve chosen to use an electric mixer to help me build elasticity into the mass of sticky dough. I’ve substituted whole wheat pastry flour for 1/2 cup of the white, all-purpose variety because I usually can’t bear not to. We’re in the less than 10% of American households without one but, if you really must hurry, there’s a microwave version. – Combine the yeast, sugar, and warm water in a large mixing bowl, stir to dissolve, and let mixture sit until it becomes foamy on top. Mix flour and salt together in a separate bowl. – Add the flour and salt mixture and warm milk in alternate portions while stirring vigorously (or mixing with paddle attachment) to form a loose dough. Beat the dough very hard until it shows some elasticity and looks almost ready to leave the sides of the bowl. It will remain loose and sticky. When it has an almost gummy quality, cover and let rise in a warm place for about 1¼ to 1½ hours, until doubled in bulk. Stir down with a wooden spoon, add the dissolved soda, and beat vigorously again for about 1 minute to distribute the soda thoroughly, or the bread will be streaky. – Butter a 9-inch loaf pan, make sure to cover all sides well (or line with parchment paper). Fill pan with dough, using a rubber spatula to scrape it from the bowl. Let rise again in a warm place for about 1 to 1¼ hours. – Heat the oven at 375°F. Place the bread in the oven and bake until it is golden on top and shrinks slightly for the sides of the pan, 20 to 25 minutes. Cool in the pan for about 5 minutes, then turn out onto a rack to finish cooling. If necessary, loosen loaf from the edges of the pan with a knife. Cut in ½ inch slices for toasting. 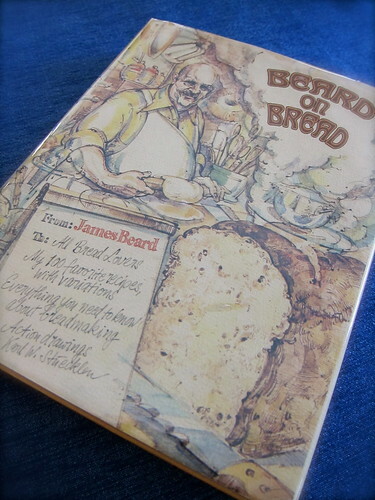 Adapted from “Beard on Bread” by James Beard. Local ingredients: Whole wheat pastry flour from Brookford Farm; milk from Harris Farm. Oh , my word! That looks fabulous! Never had much luck with his recipes, for some reason, but I’m tucking this away to try soonest. Thank you! Thank-you, Anne-Marie, for catching that! I’ve corrected the amount of milk to read ⅞ cup. I can’t vouch for the microwave version, it seems to be half of the original Beard recipe. The biggest difference I found was that the size of loaf pan Beard recommends was too large, and used a 9-inch loaf pan for the bread in the photo. Let us know how your loaves turn out! Good morning! I started reading your blog a few months ago and am finally commenting! My husband and I were crazy organic gardeners in NM and have since relocated to the southern US to the Shenandoah Valley. In NM, I grew 30 varieties of tomatoes and was a little obsessed! I am trying my hand at it here and have many started on the grow stand. Anyway, we also bake a lot of bread. I made your recipe for this bread and loved it! My family liked it better than the wheat, French, and sour dough that we usually make, which is surprising since the others take a lot more effort. I had a few questions. What do you recommend to beat the bread prior to the first rising? I do not have a bread attachment for my mixer and tried doing it by hand, but it was very difficult. I ended up using my regular mixer blades, which may not have been the best, but seemed to work. Also, it seemed excessively moist with the quantity of ingredients listed, so I added a half cup of flour, which helped. The holes in my bread were smaller than yours, which I am guessing is because of the way I mixed it…. Also used a little different flour mixture than listed. Thanks for creating this blog. I enjoy it!